This is the second of three volumes devoted to elementary finite p-group theory. Similar to the first volume, hundreds of important results are analyzed and, in many cases, simplified. 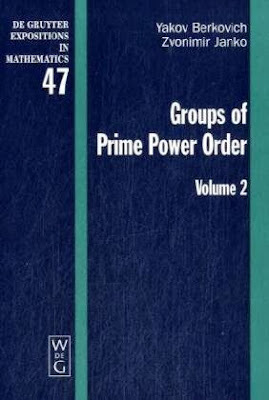 Important topics presented in this monograph include: (a) classification of p-groups all of whose cyclic subgroups of composite orders are normal, (b) classification of 2-groups with exactly three involutions, (c) two proofs of Ward's theorem on quaternion-free groups, (d) 2-groups with small centralizers of an involution, (e) classification of 2-groups with exactly four cyclic subgroups of order 2n > 2, (f) two new proofs of Blackburn's theorem on minimal nonmetacyclic groups, (g) classification of p-groups all of whose subgroups of index p² are abelian, (h) classification of 2-groups all of whose minimal nonabelian subgroups have order 8, (i) p-groups with cyclic subgroups of index p² are classified. This volume contains hundreds of original exercises (with all difficult exercises being solved) and an extended list of about 700 open problems. The book is based on Volume 1, and it is suitable for researchers and graduate students of mathematics with a modest background on algebra.